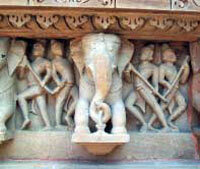 For all the publicity and the world heritage status, Khajuraho is still seeped in mystery and frozen in time. 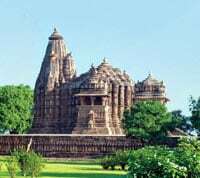 One thousand years ago, under the patronage of the Chandella kings of central India, 85 temples, magnificent in form, and richly carved, came up on one site near the village of Khajuraho. Today, of the original, only 25 have survived the ravages of time. These remain a collective paean to life, to joy and to creativity, and to the ultimate fusion of man with his creator." This note, placed at the entrance of my room at The Temple View Khajuraho, set the tone for the fourth, bi-annual Lalit Arts Festival-an attempt by the hospitality chain to celebrate this temple town, famed for its sculptural wealth. My journey had begun with an overnight train ride that lasted a good twelve hours and ended at the quaint little Khajuraho railway station. Cozy and quiet, the station has acres of greenery and rolling hills by its side. A welcome break from other tourist towns, as you don't find guides and rickshaw-wallahs here waiting to fleece you. But then again, this isn't your usual temple trail. A bus ferried us to the hotel, a comfortable 20-minute drive from the station. The hotel stands closest to the western group of temples, the most visited part of the temple complex. Food and a quick nap later, we headed out. The hotel offers both car and bicycle rides but the latter is a lot more fun, as the temples are barely 200 metres away. The temples were built between AD 900 and 1130 by the Chandella rulers, a Rajput tribe of mixed blood claiming descent from the moon. Historians consider the Chandellas' choice of Khajuraho as something of a mystery, but there's a local legend that traces the origins of this dynasty and the sculptures. Folklore has it that Chandravarman, the founder of the dynasty, was born out of a dalliance between Hemavati, the beautiful daughter of a priest and the moon God. Hemavati, distraught at the thought of having borne a child out of wedlock, was comforted by Chandrama, who predicted that their offspring would go on to be the founder of the Chandella dynasty. Although an imaginative bit of folklore, what remains true is that under the Chandella princes, Jejakabhukti (as Khaujraho was previously known) was swept by a cultural upheaval of sorts, that manifested itself in the flowering of an architectural movement of uncommon vigour. 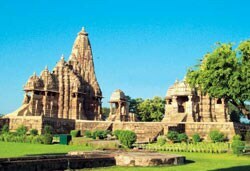 The rulers were patrons of the Mathura School of Art, and brought in artists, who adorned Khajuraho with numerous tanks and scores of lofty temples. The temple town sank from public consciousness soon after the Chandella dynasty faded in the 13th century, and was only rediscovered in 1838 thanks to a British engineer, T.S. Burt, who heard of the place from his "palkywallah" and ventured into the forest in search of the wonders of "Khajrao". When the temples were excavated, they were divided into western, eastern and southern zones, and the western complex, comprising a set of twelve temples, is the most notable of the lot. The sculptural brilliance is on ample display the moment one sets foot inside the complex. From the Varaha and Lakshman temples, depicting the various incarnations of Vishnu, to the majestic Kandariya Mahadeva temple at the centre, the temples are poems set in sandstone, with the whole pageant of life being played out on its stone walls. The images-of foot soldiers readying themselves for a battle, of a sensuous and sublime apsara plucking a thorn from her foot, even the rotund figurines symbolising wealth and prosperity, tease you with their beauty and proportion. The temples variously belong to the Saiva, Vaishnava and Jaina sects, but in spite of these divergent affiliations, they stick to a dominant architectural and sculptural style. So much so, that save a few distinctive images for each sect, there is nothing to distinguish a Vaishnava temple from a Saiva one. While the Varaha, Kandariya Mahadeva and Chitragupta temples in the western complex come alive with extensive depictions of life in all its glory, the Jawari temple on the eastern side is a must-see for its well-proportioned architecture. It took us two days to explore the temple complex fully, and the evenings more than matched up to the day's delights. The festival, inspired by the theme Moksha or spiritual release from the cycle of rebirth, showcased some breathtaking performances on the banks of the Ken river, a thirty-minute drive from the hotel. 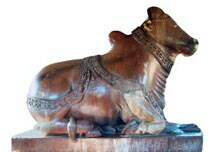 There is so much to see and do in Khajuraho, that I came back with the feeling of wanting to return soon. The area around the heritage zone is no more than a village, and it can't be your idea of a pampered holiday, but where else would you find such a happy and unique coincidence of religious emotion, artistic genius and aesthetic sensibility? Getting there: One-and-a-half hour by flight from New Delhi. You could even try the Sampark Kranti Express, that leaves every alternate day from the Nizamuddin Railway Station.